Microsoft refreshed its Surface line today, taking the wraps off the new Surface Pro 6 at a dedicated event in New York City. 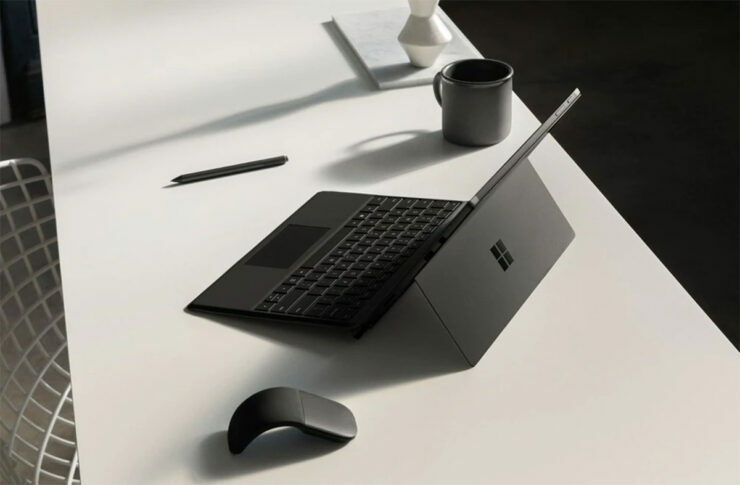 The tablet/laptop hybrid isn’t much of an upgrade when it comes to the design, but the innards have been updated and if you must know, Microsoft has retired the 4GB RAM variant of the Surface Pro 6 lineup thankfully. The Surface line has always been class leading and the latest product also seems to show promise. The design is familiar, with the same 12.3-inch display with a resolution of 2,736 x 1,824 and a form factor of 3:2, but Microsoft says that 267PPI is a major improvement and the contrast ratio is also its best ever. The device also has an 8.0MP HD rear-facing camera and a 5MP, 1080p front-facing shooter that can come in handy during Windows Hello and video calls. The Surface Pro 6 will be available in two RAM configurations: 8GB and 16GB. If you go with the 8GB variant, you can either go for the Intel Core i5 processor or the Intel Core i7 chipset, whereas the 16GB model is powered by the latter. Microsoft has touted the Intel Core i5-powered Surface Pro 6 as being suitable for those whose work centers around photographs, videos, presentations, and reports. It is also compatible with Surface Dial, a puck which could be placed on the Surface Studio’s display to create radial menus and serve as another form of input. The 8GB variant underpinned by the Intel Core i5 is available in two storage configurations: 128GB and 256GB, while the Intel Core i7 one is available in the 256GB storage configuration if you opt to pair it with 8GB of RAM. The Intel Core i7 fueled device is targeted at heavy users and also includes Intel UHD graphics. It has sufficient firepower to let you play your favorite games without disruptions. Support for Surface Dial is also included. The 16GB Surface Pro 6 powered by the Intel Core i7 is available in two storage configurations: 512GB and 1TB. The same charging connector and USB 3.0 ports have been retained. The device also offers up to 13.5 hours of battery life, and it will be available in the colors black and platinum for now. The base model, which features a Core i5 quad-core processor coupled with 8GB RAM and 128GB of internal storage starts at $899, while the variant sporting a Core i7 quad-core chip, 16GB RAM and a 1TB PCIe SSD will set you back by $2,299. Bear in the mind that the Surface Pro that was introduced last year was peaking at $2,799, with the base model featuring 4GB of RAM instead of 8GB RAM, so the Surface Pro 6 is certainly a step up in the right direction. Its highest configured model offers the same storage, memory and a much faster processor for $500 cheaper, so it appears that Microsoft is headed in the right direction, to an extent.